Ok I know I'm the one who's been singing and dancing about Halloween like a fool. But I hope you'll allow me to be a fool about Christmas for a brief moment. 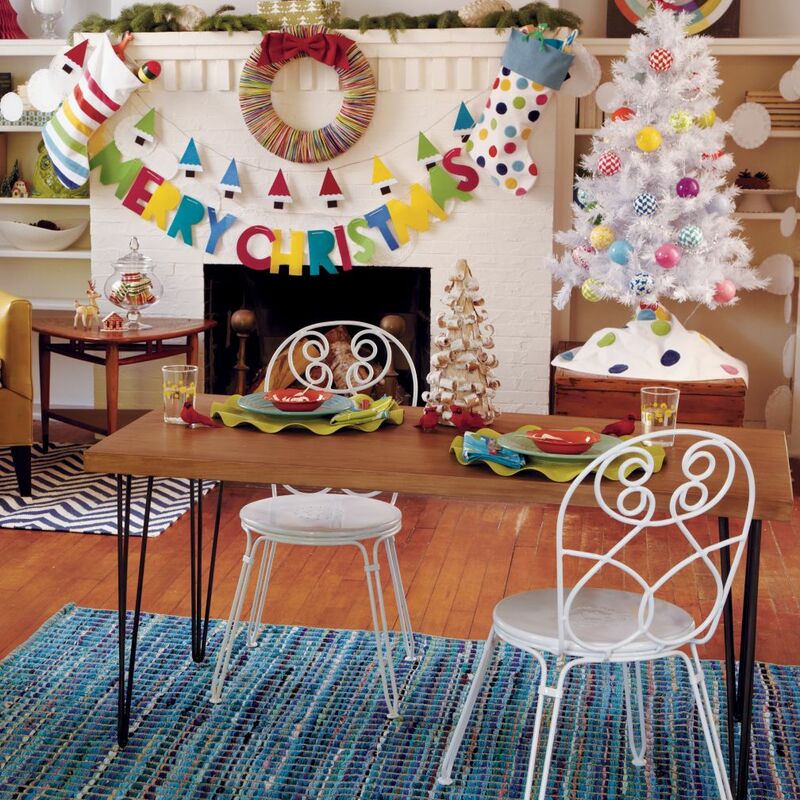 I just saw this Christmas garland in the latest Land of Nod catalog and I am WILD about the entire room! Fun. Happy! LOVE THE WHITE TREE! (I've been wanting a white tree for ages.) I'm sure someone crafty could make that garland easy peasy ~ I'm not that one, (oh heck, maybe I'll try) but for $13, you know, I'm down with that. Last year I was all about gold and silver let's-be-elegant decor ~ this year I want more of a look like what's going on in this picture. I think what they did here was take a bunch of doilies and spray paint them shimmery silver and stick 'em on the wall! Isn't that fabulous?? You may now go back to carrying on with your Halloween prep, just wanted to share this tiny glimmer of Christmas sparkle! I love that first room! And the second one, too, though I'd worry that those doily thingies would look... um... junky in the light of day if I tried to make them. I must admit I totally cracked up at Andrew's comment. I was so grouchy last night I think I could use some Christmas spirit... maybe Halloween is making me act witchy I think ;) or it could just be me. I love the colors in that first room... and that second room looks terrific but I don't think I will ever be together enough to decorate bedrooms for holidays. I had a really bad morning...and then I read your post and now I am all chirpy :) I love the white Christmas tree and was looking for a small tree like that actually because my place is too small for a big tree. We used to buy really really small ones but I think we are ready to switch to a slighty bigger size :D LOL at Andrew's comment! The girls have a turquoise Christmas tree with pink ornaments. We used to keep it on our very '50s fireplace blower, but last year, we moved it to their playroom. I would make it Christmas in every room, if I didn't have to take it all down and store it later.